All eraclea formulations contain a proprietary ingredient, scientifically designed to maintain the hydration that helps retain a youthful appearance to the skin. This ingredient is the result of a half-century of research. It is a carefully crafted combination of hyaluronic acid sponges and hyaluronic acids of various molecular weights, called the HylaSponge®System. Each eraclea product features the HylaSponge system in combination with select antioxidants, vitamins, peptides and botanicals, all chosen for their functionality within the formulations. Daily Bamboo Exfoliant- This daily exfoliating micro-scrub removes impurities, oil, makeup, and dead skin cells – to leave the skin clean and fresh with a more youthful glow. It helps increase skin cell turnover rate, and resurfaces the skin to reduce the appearance of fine lines, wrinkles, pores, age spots, discolorations and acne scars. Restorative Hydrating Night Cream– A super-hydrating, non-greasy cream that works like a water reservoir, to firm, repair and restore the skin while you sleep. This nourishing and hydrating formula not only helps reduce the look of fine lines and wrinkles, but also helps skin recover from environmental stress and refines texture for renewed radiance. 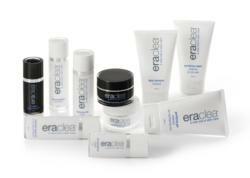 So nourish your skin with Eraclea, and get your science on with a hot professor…..